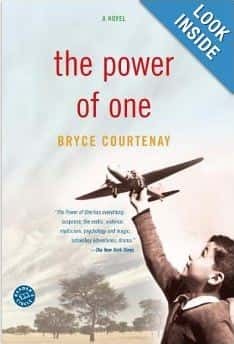 The Power Of One by Bryce Courtenay is absolutely one of the most amazing books of all time. It may even be the best book I have ever read. An inspiring story of courage and the power of the human spirit. This is one of those books that every human being should read. The Power Of One is the tale of a boy who discovers that one person really can make a difference. A well written, incredible book that will take you on a journey you will never, ever forget. Click the 'Check It Out' button below this post to see reviews from readers. I am not the only person who thinks this is a must read. This is a novel that addresses issues such as racism and violence in South Africa. It is graphic in places but the message of The Power Of One has affected many and an edited young readers edition is also available. This was Bryce Courtenays first novel, you can find out more about his work at brycecourtenay.com.